You can taste Taiheizan, KODAMA BREWING Co.,Ltd from Akita prefecture, and Wakatsuru, Wakatsuru Shuzo from Toyama prefecture. Founded in 1879 in Japan’s northern Akita prefecture, the family owned Kodama Brewing Company first produced soy sauce and miso soy bean paste, basic condiments in Japanese cooking, before it began brewing sake in 1913. The centuries old, labor intensive Kimoto method is still used to brew Taiheizan’s pure rice super premium and premium sake. Our sake is being distributed to an increasingly wide international market that includes the USA, Canada, Hong Kong, Singapore as well as Japan. Taiheizan Chogetsu is awarded Platinum Medal in Junmai Daiginjo & Junmai Ginjo category in Kura Master 2018. Taiheizan Junmai Daiginjo Tenko 20 is awarded Super Premium GOLD in SAKE COMPETITION 2018. This is Seimaibuai 20%. (80% of the sake rice has been polished or milled away.) The lower the number, the more the rice has been polished, the cleaner and more elegant the flavor. High polishing is difficult to achieve, and it is time consuming, because of that more expensive. You can buy in amazon Seimaibuai 40% Taiheizan Junmai Daiginjo Tenko. Toyama Prefecture is known for the delicious kan-buri amberjack and firefly squid of Toyama Bay, as well as for the Northern Alps, towering some 3,000 meters high. Located to the west, one finds the Tonami Plains and Sankyo-no-Sato village, naturally beautiful and the source of top-quality rice and the pure, clean water of the Shogawa River’s underground streams. It is here that you’ll find the Wakatsuru Sake Brewery, where the perfect ingredients for excellent sake are all to be found. Since its founding in 1862, Wakatsuru Sake Brewery has been focused on simply making better sake, and continues to do so. You can taste Fukukomachi, Kimura Brewery, from Akita prefecture and Tatsuriki, Honda shoten Co., Ltd. from Hyogo prefecture. The sake brewing conditions in this area are beyond perfect – the grounds are covered in a fine morning mist, and the soil used to grow the rice is rich in calcium and montmorillonite, and Honda Shoten will only do business with farmers who grow as organically and naturally as possible. 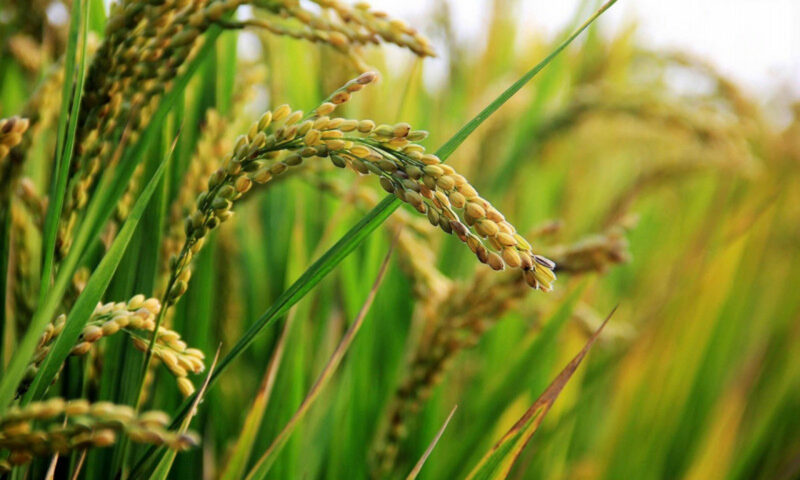 The rice is dried naturally, making for high-quality brewing.